INS Vikramaditya first to have "SBI ATM On-board"
Punjab Royals crowned champions of "Pro Wrestling League Season 2"
IIT-Kharagpur alumnus Parag Havaldar won the "Technical Oscar Award"
45th United States President Donald Trump: Mr Donald Trump has taken over as the 45th President of the United States, he took over the reins from Barack Obama at 20.01.2017 amid expectations of radical change in policies and apprehension at home and abroad. Mr Trump, 70, took the oath of office in front of about 8 lakh people who braved chilly weather to gather on the National Mall in the center of the capital to celebrate the occasion. He placed his left hand on two bibles including the historic Abraham Lincoln Bible, recited the oath of office on the steps of the Capitol to become the most powerful man on earth. He was administered the oath of office by Chief Justice John Roberts. Vice President Mike Pence: Mike Pence was also sworn-in as the Vice President of the US. He took the oath of office before Mr Trump. In his maiden address to the nation from the US Capitol, Mr Trump promised to rebuild the country to bring back their dreams wherein America First will be the key to his governance. He vowed to address the ills he sees plaguing the nation, including gun violence, drugs and crime. He said his administration will follow two simple rules - buy American and hire American - amidst applause from the lakh of people gathered at the National Mall. INS Vikramditya: The largest warship of the Indian Navy, INS Vikramditya, will be equipped with its own dedicated ATM. It will cater to over two thousand naval personnel deployed on the aircraft carrier. State Bank of India ATM: India's largest public sector bank State Bank of India is providing the Navy the services for the ATM which will be on the satellite link. A currency chest will also be provided to keep running the ATM. The much needed facility is expected to ease out cash problems of a large floating population of the warship as they run out of money during long period of deployment of the carrier. Union Minister for Civil Aviation Ashok Gajapati Raju inaugurated the Digi Dhan Mela at Itanagar in Arunachal Pradesh today. He said today an Indian citizen with aadhar card can open a bank account and carry his money in his thumb. He further said a pocket can be picked and a mobile can be lost but not a thumb. Various stalls form banking, IT sector, e-wallet and m-wallet companies were set up in the mela. Thousands of people thronged in the stalls and carried out transactions, including opening of new bank accounts or linking their aadhar card to their accounts, on the spot enrolling for aadhar card and others. Some banks have also collected application for POS machines.The one day digi dhan mela was organized by State department of Information Technology and Communication. Punjab Royals have bagged the Pro Wrestling League Season 2 title. In the summit clash in New Delhi today, the Punjab team beat Haryana Hammers 5-4. Punjab reigned supreme with their foreign imports Vladimir Khinchegashvili, Vasilisa Marzaliuk and Ilias Bekbukatov,besides India's Nirmla and Jitendra doing the damage in the crucial ties of the day.Haryana, who had remained undefeated in the tournament, thus failed to cross the last hurdle. The first flight is likely to take off next month under the government's ambitious regional connectivity scheme-UDAN. The scheme UDAN (Ude Desh Ke Aam Naagrik), seeks to boost regional air connectivity and provides various incentives to airlines. The fare for a one hour journey of approximately 500 kilometre on a fixed wing aircraft or for a 30 minute journey on a helicopter will be capped at two thousand 500 rupees under the scheme. Addressing a press conference in New Delhi, Minister of state for Civil Aviation Jayant Sinha said, Airports Authority of India has received 45 initial proposals from 11 bidders covering more than 190 routes under the scheme. He said, there are 75 operational airport in the country at present and 43 new airports will be added after the implementation of UDAN scheme. "UDAN scheme": The scheme was launched in October last year, which seeks to provide connectivity to un-served and under-served regions through revival of existing air strips and airports. The Minister said, the scheme is likely to give a major boost to tourism activities and employment generation in hinterland. Prime Minister Narendra Modi at 21.01.2017 said that centre is making all out efforts to fulfill the cultural aspirations of Tamil people.Saying that he is very proud of the rich culture of Tamil Nadu, PM Modi re-iterated that Central Government is fully committed to the progress of Tamil Nadu and will always work to ensure the state scales new avenues of progress.Earlier, Environment and Law Ministry give its nod to Ordinance on Jallikattu. SC agrees to Centre's plea to delay Jallikattu verdict.Amidst protests in support of jallikattu in Tamil Nadu, the state government announced on Friday that an ordinance would be brought in the matter in a day or two. The Supreme Court on Friday too agreed to Centre's suggestion, to pause the delivery of its judgement for at least a week.The Tamil Nadu government moved to deflate massive protests demanding the return of bull-taming festival Jallikattu by pushing an ordinance to organise the festival in 2 days. The draft for the same has been sent to the Union Home Ministry. Tamil Nadu government on Jallikattu: The Tamil Nadu Chief Minister made this announcement after his meeting with Prime minister Narendra Modi on Thursday. He also consulted legal experts in Delhi. He said with the support of centre changes will be made to the Prevention of cruelty to animals act.To create more pressure, All the 49 Mps of AIADMK, met Home minister rajnath Singh. And then they claimed that home minister has assured centre's support so that the state can implement the ordinance in the next few days. The legislators said that the ban on jallikattu is against the very ethos and culture of Tamil Nadu people where bulls and cows are treated as family members, they are revered and not mis treated at all. According to rules the draft of ordinance has been sent to the Home Ministry and after its recommendations it will be sent to the President. After President's assent, the Governor would be able to promulgate the ordinance. The Supreme Court on Friday agreed to Centre's suggestion, to pause the delivery of its judgement for at least a week till the Centre and Tamil Nadu government continue talks to resolve the issue. Environment Minister Anil Madhav Dave has also stated that a decision will be taken on the matter soon. Indian Space Research Organisation has successfully realigned the orbit of its Mars Orbiter Mission 'Mangalyaan' so it is not affected by long-duration eclipse, ISRO Chairman A S Kiran Kumar said. "Work on assembly of rocket has begun and we expect to launch it by March. The satellite will be carried on GSLV Mark II. The satellite will have provisions for telecommunication and disaster monitoring, among others," he said.He also informed that work on 'Chandrayaan II' has begun and the satellite is expected to be launched in the first half of 2018. "Experiment works on Chandrayaan II are on. We are testing soft landing engines at Mahendragiri and a place in Karnataka by simulating lunar surface. We plan to launch it in the first half of 2018," he said. Kumar was the chief guest at the 6th convocation of Gujarat Technological University where a total 87,258 students were conferred degrees in different streams of engineering, pharmacy, business administration, computer application, hotel management, among others. The process of printing documents for the 2017-18 Budget began with the ritual 'halwa ceremony' in Finance Minister Arun Jaitley's presence. FM participated in the ritual ceremony that was held at 4 pm yesterday along with other Finance Ministry officials at the North Block. More than 100 Finance Ministry officials will stay in Budget Printing Press till Jaitley presents his budget speech. As part of the ritual, which has continued for long, 'halwa' is served to the entire staff in the ministry. This year's Budget, which will be the third full-fledged Budget of the present NDA government, is scheduled to be unveiled in Parliament on February 1. “BunkarMitra”, the Government of India’s Helpline for Handloom Weavers, went live on 21.01.2017. The helpline was launched by the Union Textiles Minister Smt. Smriti Zubin Irani on December 25, 2016 on the occasion of “Good Governance Day”. Interacting with an official of the call centrehousing the helpline agents, the Minister said that the helpline is a great mix of technology, youth and tradition.She told the officials of the Ministry to monitor issues on which maximum complaints are received, so that corrective actions can be taken accordingly. The Minister congratulated the Development Commissioner (Handlooms) and appreciated the time-bound manner in which the helpline is designed to addressed to respond to weavers’ queries and grievances.The helpline provides a single point of contact to handloom weavers across the country for addressing queries and providing guidance. This helpline can be accessed by dialing the toll free number 1800-208-9988. An IIT-Kharagpur alumnus has won the prestigious Technical Achievement Award (the Scientific & Technical Awards prize), popularly called the 'Technical Oscar', awarded by the Academy of Motion Pictures and Sciences. Parag Havaldar: Parag Havaldar, who graduated from IIT-Kharagpur in 1991 with a degree in computer science and engineering, has been awarded for "the development of expression-based facial performance-capture technology at Sony Pictures Image works". He will be awarded a certificate from the Academy at Beverly Hills on February 11. A software supervisor at Sony Pictures Imageworks, Havaldar leads the team in the area of performance capture. The technology developed by him and his team has been used to create stylised and realistic character animations. Havaldar's popular works include Watchmen, Green Lantern, The Amazing Spider-Man and Beowulf. Dharamsala declared second capital of Himachal Pradesh Himachal Pradesh Government has declared Dharamsala as the second capital of the hill state with a population of about 70 lakh. Henceforth winter session of state legislature will be held in Dharamshala. Earlier the city had held 12 Winter Sessions of the state Assembly. Dharamsala is located in Himachal’s Kangra district near snow-clad Dhauladhar ranges. It was formerly known as Bhagsu. It was selected as one of the hundred Indian cities to be developed as a smart city under Union Government’s flagship Smart Cities Mission. The city already figured prominently in national and international map due to its significance owing to many reasons including religious, adventurous and natural tourism. It is also being abode of Tibetan Spiritual head Dalai Lama and the headquarters of Central Tibetan Administration (the Tibetan government in exile). 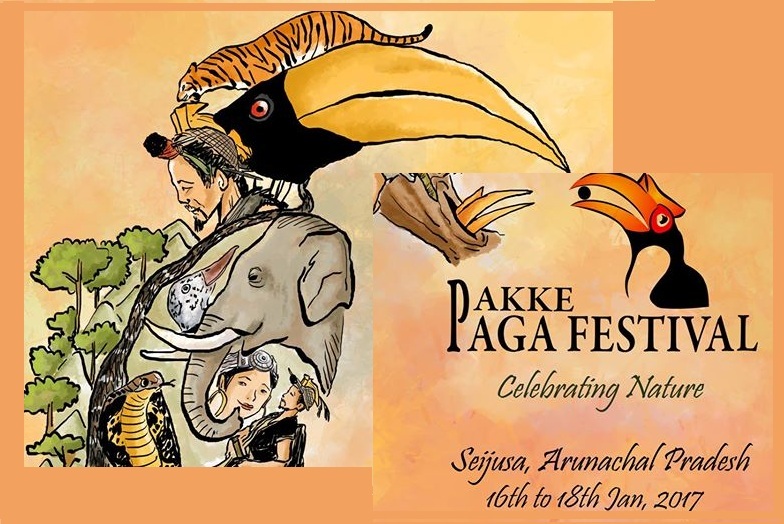 Union minister of state for Home Affairs Kiren Rijiju inaugurated the second edition of the Pakke-Paga Festival at Seijosa in East Kameng District of Arunachal Pradesh. Paga means hornbill in Nyishi language and the aim of the three-day festival is to popularise the role played by the community in conserving the endangered species. Seijosa is 130km from Itanagar. Addresing the inaugural function shri Rijiju called upon the local people to come forward in preservation of the flora and fauna of the state. Festival director Tamo Dada told that the festival is being celebrated at Pakke wildlife sanctuary and tiger reserve where visitors can witness the great Indian hornbill, wreathed hornbill, oriental pied hornbill and rufous-necked hornbill, and more than 300 other bird species. Dada said the festival will allow visitors to adopt a hornbill nest with a minimum annual contribution of Rs 5,000. "We will provide a monthly report of the adopted nest to the person concerned," he said. He said 16 wildlife conservation NGOs are supporting the event, which is organised by the state department of environment and forests and residents of Seijosa. Tents have been provided for tourists' accommodation. Visitors can enjoy local sports and cuisine, jeep safari, elephant safari, bird-watching, butterfly walk, family rafting and other activities during the fest where over 11 communities from Assam and Arunachal Pradesh will perform.